Performance, higher quality, and the only leading Tritoon manufacturer with an all-welded aluminum hull and deck. No cheap fasteners, no wood, means no worrying about rot. Built standard with a salt water and rough water package to protect your investment for years to come. This VR25RC was built in Arkansas for the Gulf and Florida markets and we are the only dealer in the Mid-west with the full Veranda line-up of boats including a new truckload shipment of 8 units. Purchased at the boat show deal offer, yet tagged and featured as 2018 models. Demo one today, you wont believe how solid and dry the ride is, even in 2 foot chop. 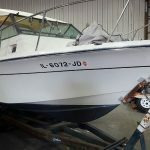 Price includes dealer prep, rigging, lake test, and freight in costs from Arkansas. You will not find more family value for your dollar than this Veranda Relax Series tritoon. We offer financing, trades, delivery anywhere in the USA and full dealer services, Call or Contact us today.